After the curtain falls on a theater production's closing performance, cast and crew say goodbye and let loose together one final time through the grand tradition of the cast party. Also known as a wrap party, the event is meant to offer a celebration of the group of people who have been working together closely to put on their show. Flyers backstage of the production invite cast, crew and their significant others to the wrap party. Sometimes there is an area for the cast to sign if they are attending, if the organizer needs a head count to plan. Cast parties are often held either in the theater in which the group has been performing or at a bar or restaurant. 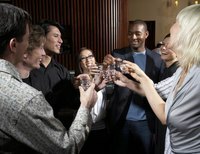 When reserving a bar or restaurant, a private room booking allows for the cast and crew to let loose without offending other patrons. If hosting the party at your theater, set up a bar and buffet for drinks, snacks and food; however, keep the food and drink in an area that won't damage the stage, auditorium or any sets, costumes or props if it spills. At either location, decorate with items struck from the set that will not be used again and pictures of your cast and crew from throughout the production. Hang posters from the production and place print outs of any positive reviews that you received throughout your run. Take a few moments at the cast party to wax nostalgic about the run. Allow for the director and producer to say a few words to the cast, and then invite the leading man or lady to give toasts. Put this at the front of your agenda to set the tone for the party and to allow for people to mingle after. Offer up a musical playlist of songs the cast and crew listened to backstage during the production and any that were used in the production itself. Food and drink choices will vary based on your cast and crew; a quick survey backstage during your run will help you determine how many vegetarian and gluten-free options you will need to offer. If booking a restaurant, be clear about this when planning your menu. If your production involves children, plan for kid foods such as chicken fingers or pizza. An adult production will expect a bar -- or at least plenty of wine. Name drinks or foods after characters in the production, such as renaming a martini as the "Leading Mantini." Appetizers can be known as the Supporting Cast. It is traditional for the director to give some sort of wrap gift to each cast and crew member. Personalize each gift toward the recipient, using knowledge gained throughout the production or have items made commemorating the show, such as engraved glassware, including the name of the production and the run dates. If you took a lot of pictures throughout the production, have a local photography processor assemble them into a book that you can print multiple copies of for each member of cast and crew. Include blank pages at the back of the book, and also give everyone a pen, so that they can be signed like a yearbook. Programs and posters can also be used to sign in this way. If your actors don't mind watching themselves, you could also watch a DVD or recording of the production together. Most importantly, socialize and spend time with this group that you have worked closely with and are likely saying goodbye to.